On November 2018.Although booking is available now .you can book your grazia by token amount of 2,000 rupees. Grazia automatic Engine is same as activa 125.Grazia Scooter is not yet launched but according to some of its spy images it seems to be amazing and futuristic design.Honda activa is most trusted brand in india .Let see how its new sibling impact on younger generation of India.Honda Grazia price is approx 60,000 x-showroom and can be available in 3-4 color option.Rival of Honda Grazia is Suzuki Access125 and Activa125 in this 125cc segment. We not yet physical see the model but as per the leaked image GRAZIA looks marvelous and kind of similar like dio 2017 model.The Grazia gets futuristic like semi-digital instrument console, which help the new scooter have a really upmarket feel. Up front, you get a really unique design that features a wide headlamp cluster and a lot of usage of black fiber .It also looks like Honda Activa 122 and Scooters India will offer some solid paint options on this new 125cc scooter. We are 100% sure that the new Honda Grazia automatic scooter would appeal to all those looking for something more then activa, stylish and powerful 125cc gearless scooter. 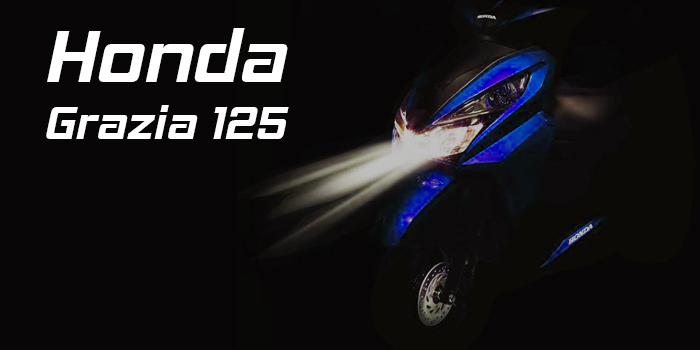 as we know that engine came from the Activa 125, the mileage will be the same. Safely approx this 125cc automatic scooter to deliver a mileage of 50 to 60 kmpl.Although weight factor can be different from activa 125. The engine capacity for the Grazia 125cc scooty comes from the Activa 125.It gives Maximum power of 8.52 BHP @ 6,500 RPM and a peak torque of 10.54 Nm @ 5,000 RPM. The motor comes mated to a CVT gear. This engine is known to offer a enough acceleration and performance is commendable. Compare to to the Activa 125, the new 125cc automatic scooter will have an optional 190 mm front disc brakes.which is very helpful in braking. It has a Front Disc Brake .An Electric Start button .Grazia has unique Design and equipped with Telescopic Front Forks.Alloy Wheels also help in mileage and riding range.The Attractive Metallic Paint Options is key success of honda Grazia.Large Headlampand Mobile Charging Socket with Digital Speedo Console is trend in scooter these days. Price is not yet Disclose by Honda Motorcycles and Scooters India but we presume that it would be between 58000-61000 as per the current market and rivals available in this segments. Honda is known for its engine and now its shooting up its graph in design category. So if you want a trustful engine with style then this would be your pick, because in term of engine and performance in day to day life honda did a really good job.Final conclusion will be set when product launch in market and customers confront it for first time.If you have any questions regarding Honda Griza feel free to comment down below.